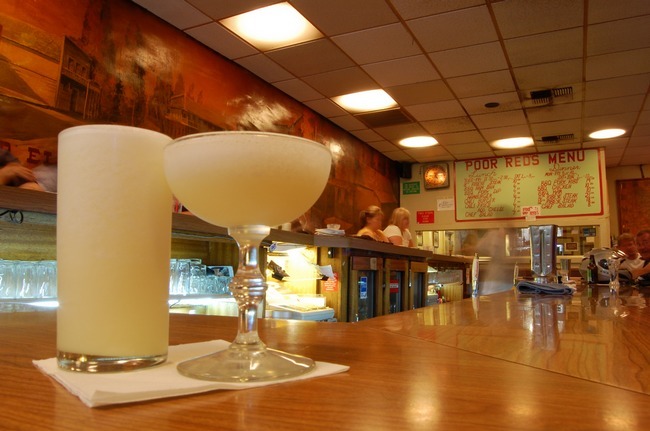 Poor Red’s is a small restaurant and bar off the beaten path where stepping inside the door is like stepping back in time. It’s truly one of a kind, a must see place. I wonder if Guy Fieri knows about it? 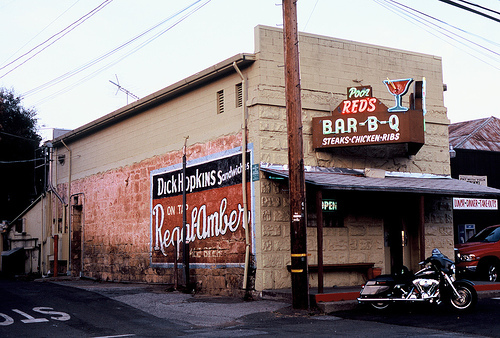 Poor Red’s is famous for their award winning BBQ, and also for a world famous drink they concocted called The Golden Cadillac. This drink tastes so good it’s like having a vanilla shake, but you can never drink it fast because you’ll get a brain freeze. The sweet after-dinner type drink is made with the Italian liquer Galliano and a few other items (recipe below). The Golden Cadillac drink made Poor Red’s the largest consumer of Galliano in the world. That’s huge for such a small place, world’s largest consumer! right there in the tiny town of El Dorado, so far away from Italy. In a blender with the motor on high blend 5 ice cubes, crushed, 3 tablespoons heavy cream, and 1 ounce each of white crème de cacao and Galliano for 15 seconds, or until the mixture is smooth, and pour the mixture into a chilled saucer-shaped Champagne glass. Makes 1 drink. 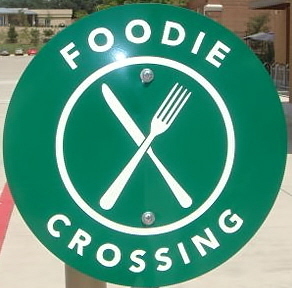 Next Post August Food Holidays to Celebrate! This is absolutely has become the WORST bar in the western U. S. for making Gold Cadillac cocktails!!! Which USED to be their signature beverage! 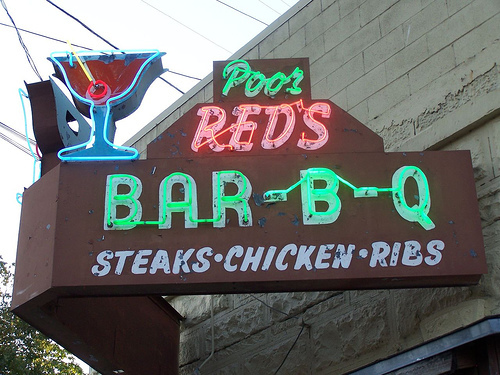 I’ve been going to Poor Red’s for the last 55 years, including my years as a kid with my parents. They used to have at one time, great ribs served with finger bowls. But the last time I had ribs there, was a year and a half ago, and the ribs were awful,( greasy, fatty un- flavorful) …REASON…new UNCARING owners! When I had a Gold Cadillac, a year and a half ago, and today, the drink was awful as well, as it was today…it was terrible! REASON the LOSER owners must figure it this way…Galliano is around $38.00 retail for 750 ml and Cream de Coco runs about 8.99 for 750 ml. A year and a half ago the cocktail was way watered down and I sent it back, only to have a slight improvement. Today, the drink was 100% cream de coco at, around $8.00 a drink. I notified the bartender, and stated that the drink had no Galliano, or such a minute amount that I couldn’t taste it. He said he could SEE it in my drink, go figure…. What a joke of a bartender! due to their own greed. Because the cuisine, and their signature drink ,is non existent,.. in reality. Boycott this place, unless you have a beer, and get your Gold Cadillac and ribs at a place that know how to create them, the currant owner of Poor Red’s simply doesn’t care. That is horrid. I used to go there in the 70’s, 80’s, and early 90’s.I loved it. It was always exactly the same, same waitstaff, same food even down to the single sliced beet on the salad. I have been looking forward to going again in a few years when I visit California. I guess I had better check if hey have improved before I revisit my favorite bar again. I used to love to meet my friends at Poor Reds – it had such a great old time feeling to it. The drinks were cold and good and resonablely priced. It started going down hill when the current owners purchased it in the mid 2000s. All the people working there now are rude and bicker constantly. The food is poor and the caddilac costs…….$9.00!!! Talk about gouging the customers! They have run the place into the ground and all the locals out! Their time is short. A business run so poorly and w/o any interest in service or quality is going the way of the Dodo like the current owners. Who would pay $9 for a drink? I used t go there and we would each have at least 5 or 6 drinks, plus an order of ribs, with the salad with the iconic crinkle slice of beet on top.The bartenders would always top off my drink with extra from the blender. We know that an experienced bartender can measure the drinks exactly. They made the extra to give away just to be nice and create goodwill. Ya got to know by now about the new owners…;yup greed has sent them to jail. And you know, Rodney, the original bartender committed suicide when the new owners fired him. He loved that job for over 30 years. A**holes. I will never set foot in that crap hole again. Too Bad. What happened to Marty? he was the bartender in the 60’s. I am torn to hear of such a sad evolution of of one of the most memorable places in my life. Most every weekend for almost two years. Gold Cadillac was the most expensive mixed drink there. $2-$2.50 for a serving glass plus a backup mixing glass full that often had more in it than the serving portion. That is horrid. Not only is it mean and wrong to fire someone who has been working faithfully with customers for 30 years, it’s stupid.It is s surefire way to loose customers. Wow. Just now recalling these great Golden Cadillacs of the 70’s following a hard day of playing in the north fork of the American River… and surfed these here webs only to find all this history. Heartbreaking. I’ll make a go of it here at home. Is the ice cube/cream/ alcohol recipe as listed above, the original? I can’t bear to go there and face the disappointment. We used to sit on the front porch and pitch silver dollars to the center line of the road and drink gold cadillac. If you won you had to run out and get the winnings, but back then traffic was low.